Buckeye Valley’s Liz Gedde (16) works on an Ontario defender during the second half of Monday’s MOAC showdown in Delaware. 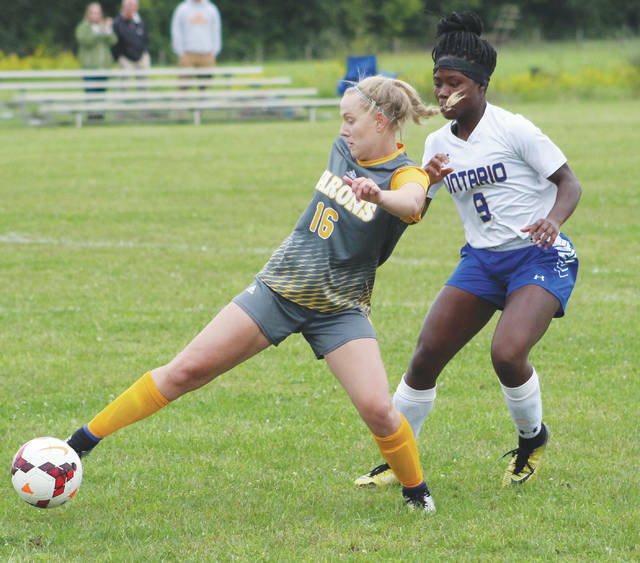 The Buckeye Valley girls soccer team scored three second-half goals, but wasn’t able to keep the ball out of its own net en route to an 8-3 MOAC loss to visiting Ontario Monday in Delaware. The Barons found themselves down 4-0 at halftime and 5-0 a handful of minutes into the second half. Liz Gedde and Daelynn Rosser gave them some life, scoring back-to-back tallies less than a minute apart to tighten the spread to three, but the Warriors responded with three unanswered goals to all but seal the deal. Buckeye Valley’s Faith Durbin scored in the game’s final minutes to smooth out the scoring summary. Cami Crawford was busy in the BV goal, finishing with 11 saves in the setback. Grace Brinkmoeller rallied for a thrilling three-set win at first singles to lead Delaware Hayes to a 3-2 non-league win over host Bishop Hartley Monday at Wolfe Park. Brinkmoeller lost the first set of her showdown with the Hawks’ Gia Green 0-6, but stole the momentum with a 6-4 win in the second before sealing the deal with a 7-6 win in the third. The Pacers also got wins from Evelyn Mignanou and the doubles duo of Renea Haferman and Alana Kay. Mignanou won 6-0, 6-1 at third singles while Haferman and Kay teamed up to notch a 6-1, 6-0 win at first doubles. Mackenzie Furches fired a team-best 47 and Emily Longworth carded a 51 to lead Buckeye Valley in Monday’s dual against visiting Dublin Scioto at Oakhaven. BV’s other scorers included Kirsten Fridley and Madison Lowe, who finished with respective rounds of 56 and 62. Kavya Manocha carded a 37 and Sarah Latzke finished with a 38 to lead the Patriots to wins over the Panthers and Golden Bears Monday at Raymond Memorial. Sienna Sakich scored three goals, two as part of a 3-0 first-half burst Olentangy Liberty parlayed into a 6-1 win over visiting Granville Monday in Powell. Haley Eckhert, Lexi Cantrell and Addie Druckenbroad also found the back of the net in the win. Lyssi Snouffer had a monster game, finishing with 27 kills and 25 digs, but Fredericktown had a few standout hitters of its own do some damage on the way to a five-set win Monday in Delaware. The host Eagles got off to a good start, winning the first set 25-18, but the Freddies answered with wins of 27-25 and 25-22 in the second and third, respectively, to take a 2-1 lead. DCS regained its form in the fourth, winning 25-21 to extend the action, but Fredericktown won the fifth and deciding set 15-6. Allison Grover backed Snouffer with seven kills while Maggie Broadfoot had six. Grace Williams was also steady in the setback, collecting a team-best 18 assists to go with 10 digs.